Proline’s Saka Mpima clears the ball under pressure from Soana players. Photo by Shaban Lubega. 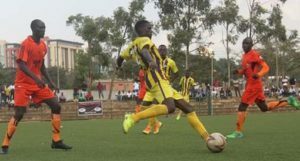 FOOTBALL–Three games where played on Tuesday evening in the Uganda Premier league across the country. In the game played at Lugogo, the hosts Proline went into the game having not scored a goal let alone won any and started scrapy with their opponents Soana dictating the tempo in the first 15 minutes. With Soana failing to convert their early dominance into creating decent chances, Proline grew in confidence and started getting out of thier shell puting the Soana defence under pressure. The relentless attack on Soana finally paid off in the 27th minute when Fahad Bayo scored a superb over head kick after the Shafic Bisaso’s side failed to clear thier lines from a corner. With five to play in the first half, left back David Owori serged down the left flank with pace and crossed low for his captain Joseph Mandela who controlled superbly before slotting the ball into the back of the net from close range to make it 2-0. With Ivan Bukenya who was clearly the best player on the pitch in the first half going of injured early in the second for Proline, Soana clearly had to pounce on that and they did just that creating several opportunities which where constantly wasted by thier fowards. Anthony Bongole had a goal correctly disallowed for offside in the 82nd minute but that is as close as Soana got to scoring, succumbing to thier second loss of the season. Muijbu Kasule, Proline FC, coach said he is happy his team won. “We controlled the game better this time round, played as a team and created enough chances,” he said. Shafic Bisaso, Soana FC coach, said he was disappointed with his team’s perfomance. “We didnot create enough chances and were dredful at the other end,” he said. The result means that Viper now go top of the standings with 10 points from four game, three ahead of Police who play on Wednesday. In the other game played on Tuesday, captain Nelson Ssenkatuka scored his second goal of the season for Bright Stars as the Mwerere based side over came Kirinya JSS 2-1 at the champions stadium. Kirinya took the lead in this one through Musa Essenu in the fourth minute, Ssenkatuka equalised in the 25th minute before Josua Kawada won it for the home side in the 77th minute.